Click here for an article and pictures from the Daily Mail. 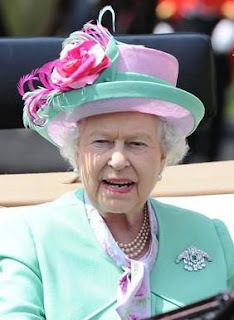 I watched the carriage procession today, and listened to the fashion correspondent talk about the Queen's mint green coat and floral dress by Peter Enrione with a matching Angela Kelly hat...and then she mentioned an emerald and diamond brooch that we see frequently. Au contraire! This is something new, or "new" as the case may be. I don't think I've seen this one before, an Art Deco diamond brooch with a central emerald. I'm not sure I like it, necessarily, but I sure do like surprises.